This product is the proven solution to center-Pivot wheel rut problems, because dramatically increases traction and flotation on difficult heavy soils, and also controls hillside track erosion on sandy soils. Thousands of center Pivot systems throughout the world that in the past were constantly stuck in the mud now run trouble free. The deep wheel ruts that plague the harvest season with breakdowns and accidents can now be eliminated. 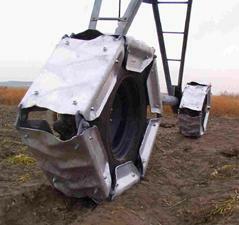 Wheel rut problems diminish the effectiveness of center Pivot irrigation. When the irrigation system is stuck in the mud, the producer is losing money. Our Track lets to focus on the needs of the crop instead of the limitations of the machinery. It gives a maximum irrigation efectiveness and makes farms more profitable. This product fits 11-24,5 and 11-22,5 recap tires with standard tractor tread lugs. The tread lugs mesh inside the product like a gear. The 12-ply casing of the truck recap tire is sturdy enough to prevent the tire tread lugs from bending over and sliding inside the product. Expensive, large diameter tires and high flotation tires that increase gearbox wear are no longer needed. The flotation and traction chart below shows that our product has 3 times as much surface area and traction as tall 38″ tires. The wheel must be moved out from the gearbox to provide adequate clearance for the system. This can be accomplished by simply reversing the wheel if the center is offset (Valley) or by installing a spacer between the wheel and gearbox (Lindsay Zimmatic, Lockwood). Our product is compatible with all center Pivot and linear systems, including corner systems, if adequate clearance is provided between the Track, drive components and tower structure. Proper installation includes both wheels on a tower. It can be installed at anytime during the season. Usually it is not necessary to fill pre-extisting tire ruts. Our Track is manufactured using the highest quality materials. The section stamping is 3/16″ thick plate steel and is hot dip galvanized. The hinge is replaceable and is made of case hardened steel and through-hardened steel bushings. Each track weighs 310 lbs. and provides 430 square inch surface area. The Track is warranted one year against defects in materials and workmanship. 8 responses to "Solution to center Pivot wheel rut problems"
Thanks for this valuable information that can help to improve center-Pivot systems operation. We would like to be aware of this kind of innovations, and appreciate your effort. We find very interesting this solution to avoid center-Pivots getting stuck in heavy soils. Hello, I am interested in your tracks for Pivot irrigation wheels, please contact me with more info. I am looking to put tracks on 2-3 towers of my center Pivot. I have a Zimmatic center-Pivot with 14.9 x 24 tires. I’m interested in this product. Nice article. I’ve got a Zimmatic centre pivot in a heavy soil, (9 towers). I am interested in your wheel rut problem solver. I have 11.2×24 recap tires on my system. I have got 4 Zimmatic Pivots that are getting stuck in clay. I am interested in your rut solutions.